Inviting colleagues or clients to Freelo is easy. Just click the plus button on the left at the top (blue) menu and click on Add Users. In the details of the project click on Users and then on the green button (+) next to the All users heading. In the drop-down menu select the colleague you want to invite to the project. Adding a user to a specific project. If you want the user to see only a few To-Do lists, check out the Invited Users option to see all To-Do lists and select only those to which they should have access. 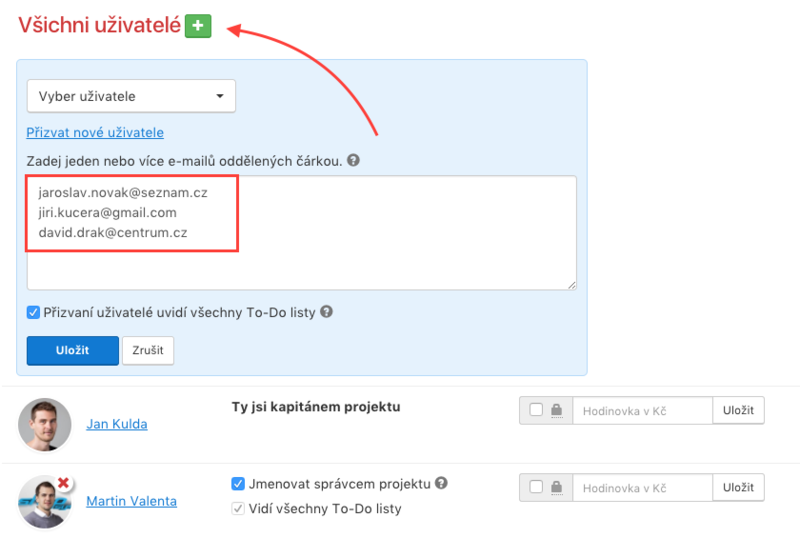 Otherwise, you can leave the checkbox checked and your colleague or client will see all the To-Do lists in the project. Confirm your invitation by clicking the Save button. You can invite multiple users to the project at one time. Simply enter their email addresses and separate them either by comma or trim (see picture below). Inviting a user to a project by email invitation. TIP: Once users are invited, you can select them from the drop-down menu. In case you need to invite a colleague to a larger number of projects, there is another option. In the main top menu, click Users > All Users. You will see an overview of all users who are invited to your account. On the left, click on the green button Invite user. Bulk inviting users through email invitations to multiple projects. A new window will open with a text field to type the email address of your colleague or client (there may be several at a time) and a listing of all the projects where you can invite the new user. Use the checkboxes to select all the projects that your colleague should have access to and confirm it with the “Add users” button. What if an email invitation does not arrive? Just remove and invite the user again to the project. A new email invitation will be sent. We recommend that you view the SPAM folder in your email. In the user’s section, we are preparing a button to resend an invitation to Freelo. Can I change password invited user? The password of the invited user can change itself in profile settings (Icon at the top right). If the password has been forgotten, you need to go through the forgotten password procedure to set up a new password.